Lisa Harkrader’s ‘A Fishy Mystery’ (2017), the latest title in Kane Press’s Math Matters series, is one of the very few mathematical stories in the market right now that explicitly and cleverly demonstrate the awesomeness of Venn diagrams. 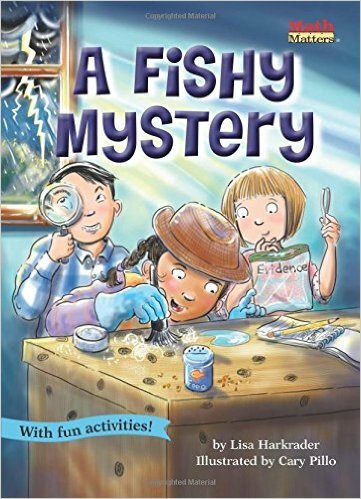 The protagonist, Thea, a keen student detective, made use of her recently-acquired knowledge of Venn diagrams to try to identify the culprit behind the disappearance of Rocky, her class goldfish! Through Ms. Gruper (the class teacher character), the story is effective in addressing a common misconception that a Venn diagram simply consists of two overlapping circles, and nothing else. The storyline is engaging. Illustrations by Cary Pillo are mathematically correct, and just great in general. We particularly adore Rocky’s facial expressions! Diversity of characters in the story is abundant. Specifically, we are pleased to see a female ethnic leading character. As with other titles in the Math Matters series, useful teaching activity ideas are offered at the back. All in all, we LOVE it! Well done, Team Kane Press! Recommended for children aged 6+ years old.